Cancer Support Group has been incredible. In an effort to give back to them Catherine and her family decided that they would take on their own personal challenges to raise some much needed funds and create more awareness for the Balbriggan Cancer Support Group. 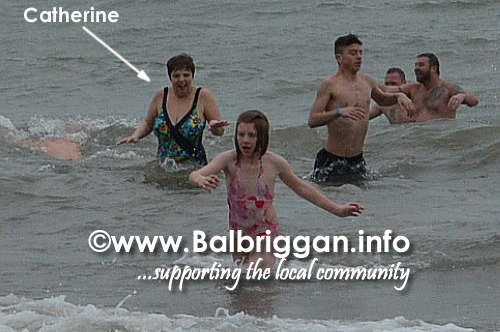 Catherine decided that she would take part in the Christmas morning Swim at Balbriggan beach. Storm Eva ensured that this was going to be a real challenge and presented driving rain, freezing conditions and high winds but Catherine met it head on and bravely took to the freezing waters. Catherine’s sister Martina, daughters Karen and Rachel and husband Declan were on hand to support Catherine and cheer her on. A BIG well done to Catherine, this was definitely the toughest Christmas swim we have seen. The rest of the family Dad Declan and daughters Karen and Rachel have decided on a 2 part challenge. The first part was to complete the Dublin City Marathon – this was the first marathon for each of them and they crossed the finish line together, as a family, at 5 hours and 49 minutes. The family have already had quite the journey so far, from struggling to complete their first 5km with 60 second run intervals in their initial training to completing 16 mile runs while on holiday in Spain. This family are certainly a force to be reckoned with. The second part of the Challenge takes place in January 2016. 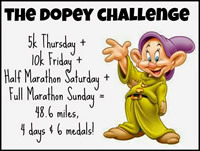 The family will be traveling to Orlando to participate in something called the “Dopey Challenge”. When you consider 4 runs (5k, 10k, 1/2 Marathon & Full Marathon to finish) in 4 consecutive days, the name of the challenge is quite fitting! You’ve had the hard sell, the cause justifies it, and the family really want to raise as much as they can for the Balbriggan Cancer Support Group who continue to provide the tremendous help and support to those who need it most, so we now ask each of you – All of our friends, family, colleagues, acquaintances, and anyone else who happens to be reading this to dig deep and make a donation to this worthy cause using the link to our gofundme page or by coming to us personally and making a donation. Every donation however large or small will be gratefully received. A big well done to the Barnes family; Catherine, Declan. Karen and Rachel , who when faced with adversity, selflessly turned to fundraising to ensure that others are afforded the same support that mum Catherine received from Balbriggan’s Cancer Support Group through a series of tough challenges. 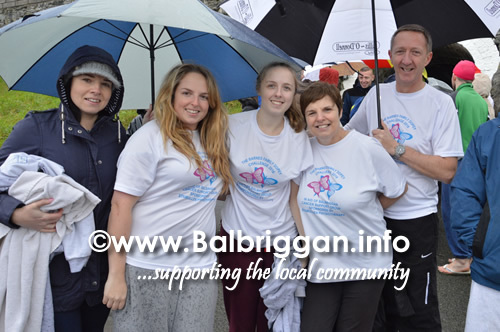 Balbriggan Cancer Support Group is a community driven and volunteer based organisation that was established in May 2010 by a group of local men and women concerned with the lack of cancer support within the area.